A common misconception about stainless steel is that it is not affected by corrosion. W hilst misleading, the phenomenal success of the metal makes this common belief understandable. One of New York City’s most impressive landmarks is the stainless steel clad peak of the Chrysler Building. It was built in 1930, in a recent inspection the landmark revealed no signs of weathering or loss of thickness. These days most households have got a stainless steel kitchen sink which, if looked after well enough, will shine as brightly as the day it was installed. Every day we come into contact with numerous examples of the success of this material, as it has proven in thousands of applications, that it is one of the most economical solutions to combat the ever present elements that can cause metal decay. Whilst the name correctly signifies the rust resistant properties of the metal, “stain-less” is not 100% “stain-proof” in certain applications. No metal, except for gold and platinum in their natural state, is completely tarnish proof. 1) Prolonged contact with water should be avoided. Leaving knives in water overnight can have the same harsh effect as three or four months ordinary use. 2) Once your dinner ware is washed, always try and dry it as quickly as possible. 3) Similarly, the damp atmosphere of a dishwasher can cause erosive effects, so remove and dry your cutlery as soon as the machine’s cycle has finished. 4) Keep the dishwasher rinse agent topped up. 5) Avoid detergents that contain lemon. 6) Never clean knife blades with silver polish as it is too acidic. 7) Avoid detergent staining by rinsing and drying thoroughly. 8) Never mix stainless steel and silver plated cutlery in the same dishwasher basket, as this can corrode the steel. 9) When hand washing avoid using liquid bleach and ensure that detergents are dissolved. Otherwise smearing and staining may occur. 10) Never use scouring pads or abrasive sponges when washing up as they can scratch. If these steps are followed you can look forward to many years of good service from your tableware. 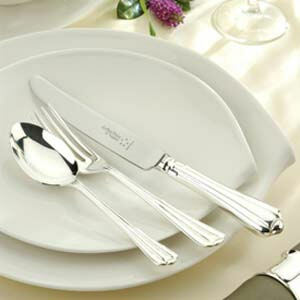 Philip Morris & Son are proud to have Amefa, Arthur Price and Stellar as key brands in our table top department, including individual knives, forks and spoons of various sizes, box sets, canteens and accessories. Amefa, Arthur Price, Stainless Steel Cutlery, Stellar. Bookmark.